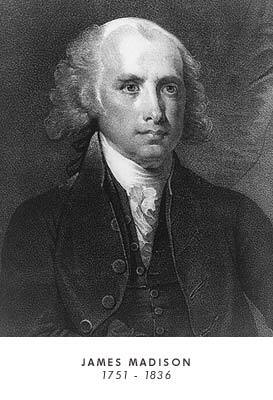 Our family organization is open to all who can show proof acceptable to the Registrar that they are related, by direct blood line, marriage, or adoption, to any lateral or collateral American ancestor of President James Madison, paternal or maternal, who was living in this country (Colony) after 1607. We have received a number of applications without any proof of lineage and we can help you locate this information if you will tell us where you have come to a stopping point in your search. We may already have the information you are searching for or can help in your search. If a member of your family has already completed an application, you need only fill out the form up to your proven line. Some members have sent family stories and pictures that are real treasures. Our largest family line is made up of the descendants of the President's brother William Madison.